Sloppy Joes are all kinds of the best things – inexpensive, delicious, family-friendly, quick and easy. The concept is simplicity itself – simmer ground meat in sauce and serve on buns. Almost a one-dish meal – it takes only a simple green salad or quick veggie to round them out into a healthy, satisfying meal. Sloppy Joes have been around for quite a while – and have become an American go-to staple. They’ve also grown over the years – made not just with ground beef and tomatoes anymore – they can be made with any ground meat, and any type of sauce. This one is the classic though – rich with tomatoes, onions and peppers, spiked with Worcestershire and garlic. They also are the best for stretching the budget – as well as working quite a few veggies into the tummies of the pickiest eaters. I recently found ground beef for $1.63 per pound, so I loaded up. This version is just about the best I’ve ever had. You won’t want the packet or canned stuff ever again – especially when you realize that this one is almost as easy as the pre-packaged sauces. And the cost is comparable as well – so you get homemade, control of the ingredients, no additives or preservatives AND the best-ever flavor. Nice! This particular recipe for Sloppy Joes makes enough to easily feed eight adults well. I made enough to have two meals out of one night’s effort. If you wish, you can cut the recipe in half, or simply place the extra mixture in the freezer for a meal later in the month – all you have to do is heat it up. That works any day for me! This one is also rather ‘saucy’ – if you wish a tighter Joe, just add a total of 2 cups of the ketchup/BBQ sauce. The sauce does tighten by the second day – so it’s a matter of preference for you. Give this one a try – you’ll be hooked on this quick, easy and delicious meal! 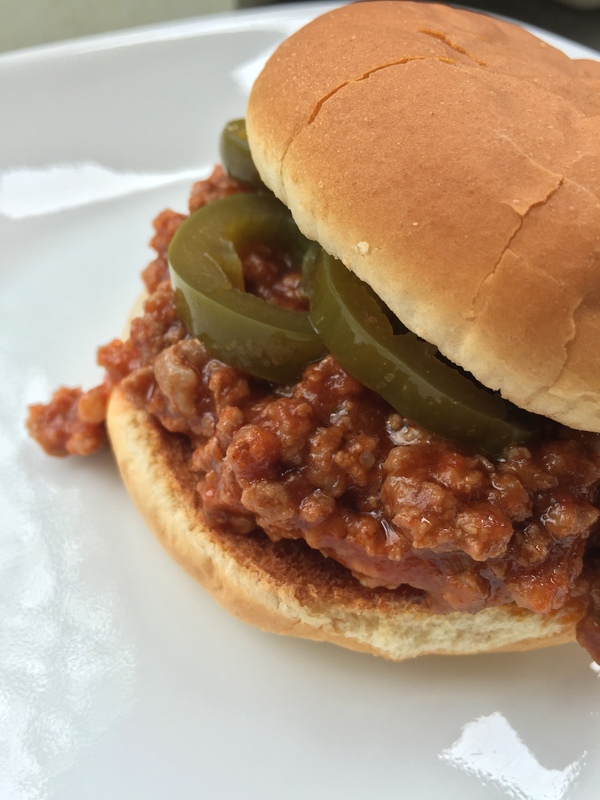 Sloppy Joes encompass the best of all kinds of things – inexpensive, delicious, family-friendly, quick and easy. The concept is simplicity itself – simmer ground meat in sauce and serve on buns. Almost a one-dish meal – it takes only a simple green salad or quick veggie to round them out into a healthy, satisfying meal. ra mixture in the freezer for a meal later in the month – all you have to do is heat it up. That works any day for me! This one is also rather ‘saucy’ – if you wish a tighter Joe, just add a total of 2 cups of the ketchup/BBQ sauce. The sauce does tighten by the second day – so it’s a matter of preference for you. Give this one a try – you’ll be hooked on this quick, easy and delicious meal! In a large skillet over medium heat, brown ground beef. Add onion and bell pepper and sauté for about five minutes. Add everything else to the skillet, stirring well to combine. Bring to a simmer. Cover and simmer for about 30 minutes. Serve with toasted hamburger buns. These are great with pickles! If you wish – you can brown and drain the ground beef, then throw everything else into a slow cooker. Set on low and walk away for about four hours. It’ll be done for you!